My daughter’s hand-me-down iPhone 3G has had a bad battery for awhile, but it hasn’t been an issue until now, as we will be traveling this week. I have extensive experience opening up Apple computers and gadgets, going back as far as 2003 when I upgraded the hard drive in my white iBook G3 to a whopping 60 GB. The only time I ever opened up an iPhone before was once to replace the back panel of an iPhone 4. I’d never tinkered with the guts of an iPhone before, but since this was just an old iPhone 3G I figured it was low risk. This iPhone is really a spare anyway. So I decided to replace the battery myself, and ordered a replacement battery from ifixit.com. It arrived in only a few days. I was excited to get started, so I didn’t bother reading the instructions before removing the two screws on the bottom of the iPhone. Then I already hit a wall and had to read the directions– I realized I didn’t know where the iPhone display separates from the bottom! After reviewing the directions, I read that the display is only the part of the phone inside the chrome bezel. 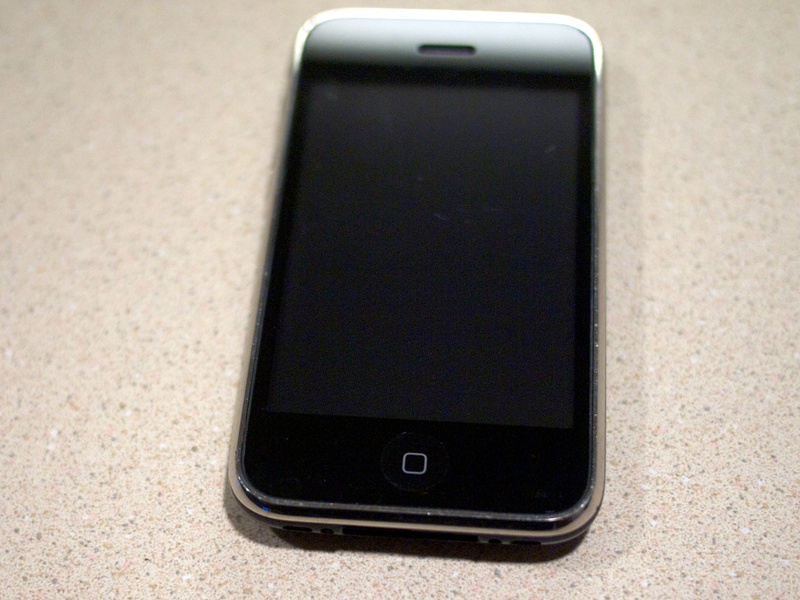 Then I hit another stumbling block– how do I open the phone? Do I pry it open like my old 2nd gen iPod? Turns out I need a suction cup or duct tape to adhere to the screen so it can be pulled off. I really wish that information was more obvious, but I blame myself for not reading the instructions. I searched the apartment for about a half hour before I finally found something with a suction cup. I used the plastic holder for a shaver in the shower to pull of the display, and it came off fairly easily. The risk in that step is if you pull too hard you might rip out the cables that connect the display to the logic board. 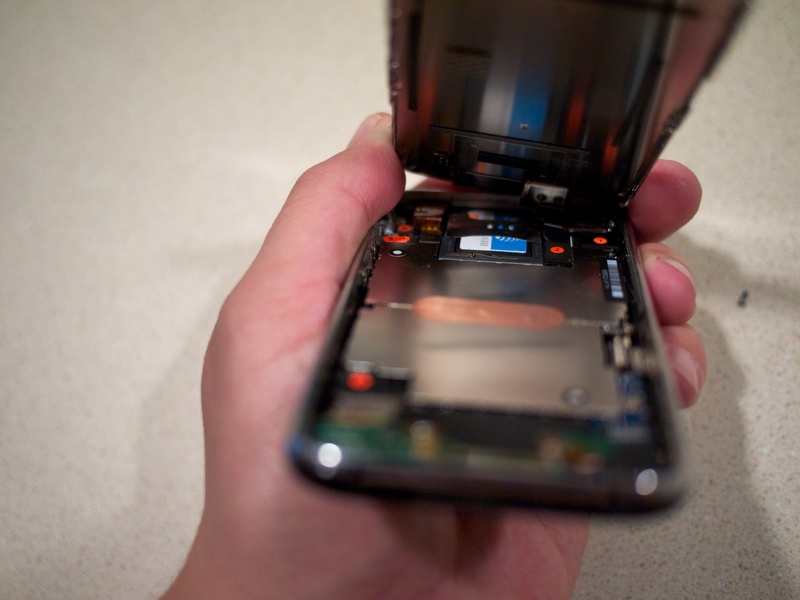 Once the iPhone was opened up, I followed the directions on ifixit.com to disconnect the tiny cables, remove the correct screws, and then pull out the logic board. Whenever there are lots of screws are being removed, it’s critically important to know where they go when it’s time to put them back in. For this project, I laid all the screws off to the side, in a pattern matching where they came from, so they look like a connect the dots puzzle. Removing the battery was tricky because it is glued to the back of the phone. I just kept prying and wiggling until it came out. I made sure not to apply to much pressure with the spudger tool because I was concerned that it might snap under pressure, but it survived. The new battery came with adhesive already applied to the back of it, so I just removed the 3M backing and carefully put the battery back into it’s snug little spot. Then I began the reassembly process, putting the logic board back into it’s spot, and screwing it in. 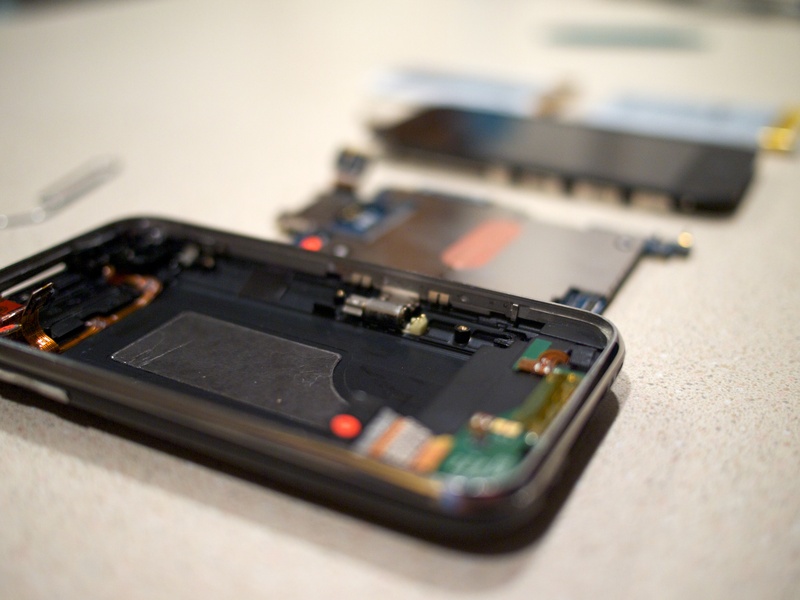 The nice thing about reassembling the iPhone 3G is that every part has it’s place with no wiggle room, so it was obvious when the battery and logic board were back in place. The hardest component to put back in it’s place is cable #3, which just slides into it’s little spot on the logic board. All the cables snap into place except this one. I used a tweezer to push it back in because it was not possible to do with my fingers. Once all the cables were in place, I decided to test it out and turn on the phone to check that everything works before closing up the case. Just then I decided to help my wife out and hold my 4-month-old baby so she could do whatever she needed to get done at that time. I plugged in the phone because I didn’t know if the battery would have a charge. I powered on the phone, and the touch screen and everything was working, and then all of a sudden the baby I was carrying grabbed the iPhone power cord and sent the phone flying to the ground, and the screen was pulled off! So I put my son down, and worked for another 20 minutes getting that pesky #3 cable in it’s spot and test everything and promptly completed the reassembly once I saw that the screen worked as it should. I wonder how the iPhone software deals with the screen disconnecting while it’s powered on? 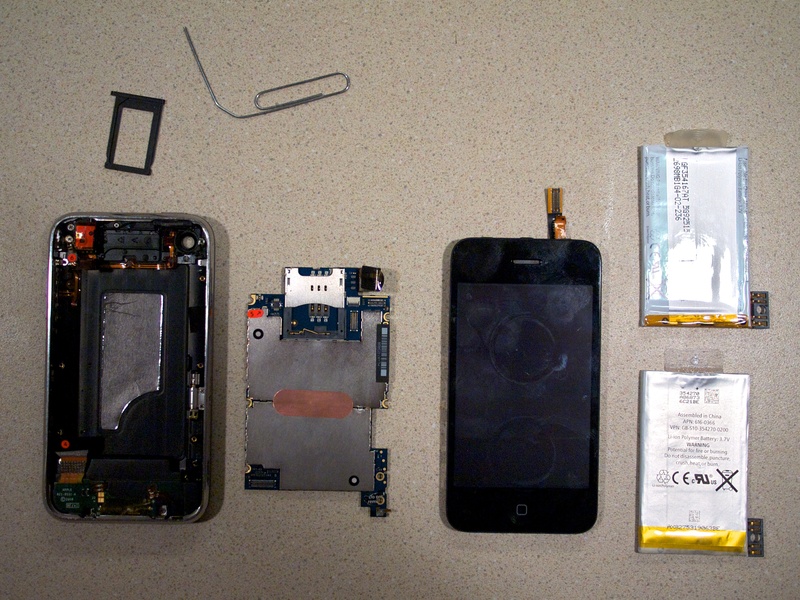 Replacing the battery on the iPhone 3G was fairly easy to do. The trickiest part is the #3 cable that you have to push into it’s tiny slot. I also stripped one of the screws, but I figure that to be a fluke thing. I would recommend others that are comfortable opening up their electronics to make this repair. Remember that 750 GB drive that was dead so I opened it up to see what happened? Well, I thought it would be a good idea to tighten that loose screw and close up the drive casing and see if it would still work or not. It is only an external drive, what’s the worst that could happen? So I turned on the drive, and after a few seconds, it showed up in the Finder! 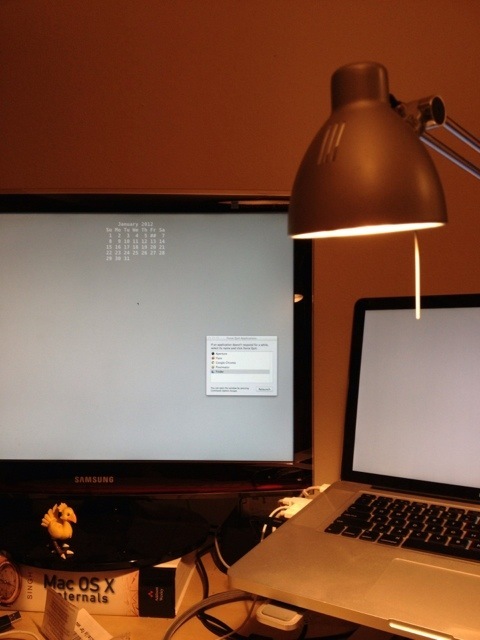 I decided to use Disk Utility to Verify Disk to see what errors it would find. Halfway through, I got the Disk Ejected error, and the disk disappeared from the Finder. It’s a goner. Then, apparently I didn’t turn off Time Machine, so the OS was trying to write to the disk, but the disk is broken, and that messed up the Finder, and left me unable to reboot. What you see in the image is my screen after trying to restart the machine. It just hung there. So I did a hard reset, turned off the bad drive, and then I was able to turn on the computer and it started up normally. 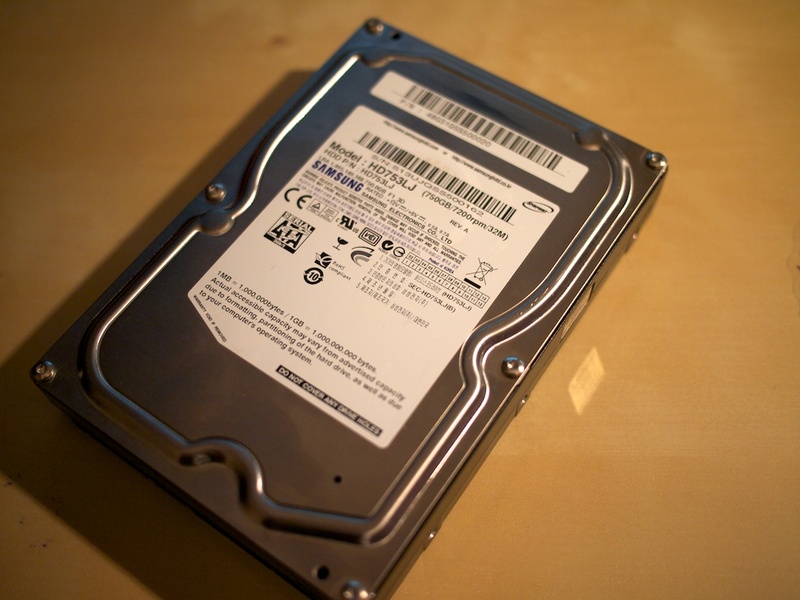 Do not bother with trying to reuse bad drives, no good can come from it! Last Saturday morning I was sitting on the couch, and I began to notice a buzzing coming from behind me. It slowly got louder, and ended in a loud CRASH! I didn’t know what happened, but I expected to find material damage of some sort after such a loud bang. However, I didn’t find any evidence of damage or smoke as I looked around my desk. I’ve been working or dealing with computers since I was a teenager, and I figured that loud sound could have been a hard drive, even though it was many times louder than any problematic hard drive I’d ever encountered. 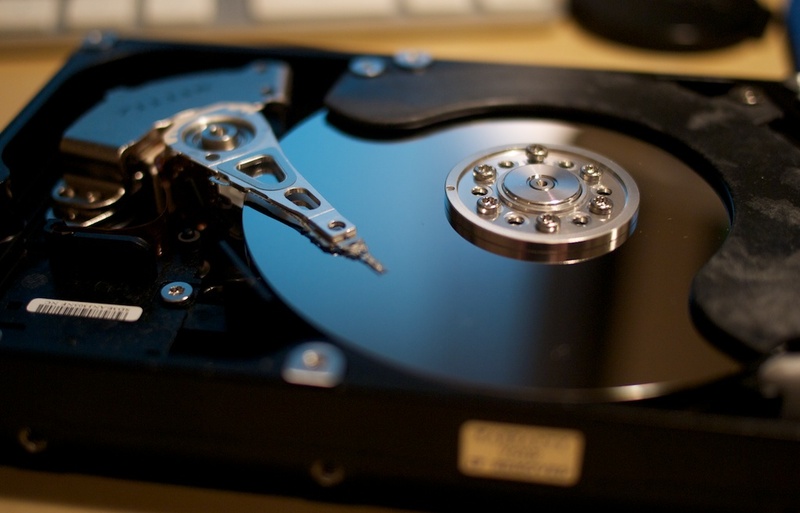 From that sound, I imagined the disk platter somehow off it’s axis, and the drive head rubbing on it and the noise getting louder and more coarse as the platter tilted further. Sitting at my desk, I noticed a broken record-like sound of a hard disk failing to spin, and then I waited to see which disk would be in the next error message on my Mac. I was just hoping it wasn’t my 500 GB internal drive, I’d rather it be my 750 GB external drive in an enclosure connected via USB. It turned out it was the external disk, which contained my Time Machine backups. A bummer, but it could have been much worse. I suspected it could be this drive, because it had made strange clicks and stutters in the past few months. It’s death wasn’t totally unexpected, but it was more violent than I thought possible. I opened up the drive and found a screw on the axis of the platters loose and heavily worn from scraping the roof of the hard drive casing. I believe this lead to the eventual head crash. The platter is badly scratched as well in a few spots. It may have been under warranty (if so, just barely) but at 750 GB it was always full and I was in need of a Time Machine drive upgrade anyway. Author barryjbroPosted on January 7, 2012 January 7, 2012 Categories HardwareLeave a comment on Crash!